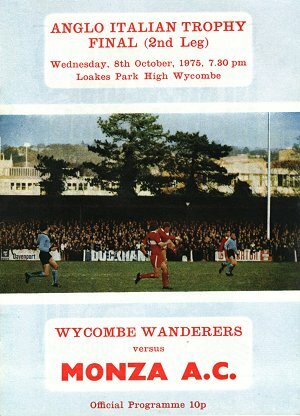 One of the most exciting evening games in the history of Wycombe Wanderers took place on Wednesday 8th October 1975 when Brian Lee's side lifted the Anglo-Italian Semi-Profesional Trophy - beating A.C. Monza on aggregrate in front of a 3,000 plus gate at Loakes Park. To put this game some sort of context for the era, success in Europe for English teams was still a relatively rare occurrence at the time of this game. The previous and solitary English success in the European Cup had been Manchester United’s victory against Benfica at Wembley in 1968. Spurs and Liverpool had won the UEFA Cup in 1972 and 1973 respectively, while Chelsea had been the last English side to lift the European Cup Winners Cup in 1971. Wanderers’ game with Monza may not have been regarded in the same level of importance as the full blown European ties involving the top English sides but the fascination of playing a competitive 2nd legged tie against foreign opposition proved a crowd puller for the public of High Wycombe. Trailing by a single goal from the 1st Leg in Monza two weeks previous, the biggest gate of the season at Loakes Park gathered to see Captain John Delaney and then cult striker Dylan Evans fire Wanderers into a 2-0 lead inside the opening 30 minutes. A buzzing atmosphere then saw Wycombe hold out to claim a magnificent trophy. 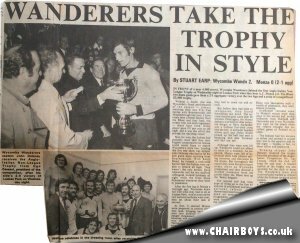 Reporting for the Bucks Free Press from Loakes Park, Stuart Earp wrote: 'In front of a near 4,000 crowd, Wycombe Wanderers claimed the first Anglo-Italian Non-League Trophy on Wednesday night at Loakes Park when they beat A.C. Monza 2-0. The Blues two home goals gave them a 2-1 aggregate victory over the two legs and a prize of a magnificent £3,000 trophy. Without a doubt, this was Wycombe’s finest performance of the season — almost matching their epic F.A. Cup battles with Bournemouth and Middlesbrough last year. I have rarely seen a better display from the Blues and they took this trophy with one main ingredient -sheer hard work. Every player gave 101 per cent on the night and it was this effort that proved the deciding factor. Man for man, the Italians had probably more skill than their English counterparts but Monza could never hope to match Wycombe’s work rate. Leading’ this five star show was skipper John Delaney who had by far his best game since re-joining from Bournemouth. With Keith Mead, he formed a rock-solid barrier that the Italians were unable to breech all night. They weren’t the only heroes. Dave Alexander and his two midfield colleagues worked tirelessly all night while the front three threatened whenever they were in possession. After the first leg in Monza a fortnight ago, Wycombe knew full well what they had to do at Loakes Park. And as soon as the two national anthems were over, they set about their task in earnest. At first, it seemed Monza were prepared to protect their slim lead, bringing back nine men into defence whenever danger threatened. Wycombe, however, still managed to find a way through. Goalkeeper Terraneo had to go down to save Tony Horseman’s sixth minute shot as Wanderers at tacked from the start. With the Blues pressing’ forward, the Italians were prepared to wait for breakaways and Tosetto almost got through after 12 minutes until Paul Birdseye raced back arid enabled John Maskell to grab the ball bravely from the striker’s feet. But it was Wycombe who were looking ‘the more dangerous side in these early stages. They needed a goal badly to get themselves back into the tie and it came with only 17 minutes gone. Dave Alexander took a corner which Monza failed to clear and after Mick Holifield and Horseman had both seen shots blocked, Delaney launched himself to head the ball home in a hectic scramble. The goal proved just the tonic Wycombe needed. Had the Italians scored, the 2-0 aggregate lead would have seen them shut up shop and defend for the rest of-the game. Now, with the scores at 1-1 overall they had to come out and attack. But before they had time to reorganise, they found themselves two down. The second decisive goal came after 26 minutes. Once again, the Monza defence was slow to clear potential danger as Dave Alexander sent a brilliant first-time cross into the box. A defender headed across goal and Dylan Evans picked up the ball and sent a bouncing shot past Terraneo and into the net. The second half had little hope of living up to the first 45 minutes of excitement and international referee John Homewood was forced to clamp down on several minor infringements — most of which were ironically committed by the visitors. Wanderers’ sheer tenacity and hard work never faltered for a moment. The Italians seemed to lose their rhythm and the Blues won themselves such a wealth of possession, they were seldom troubled. Goalkeeper Terraneo came to Monza’s rescue more than once in the second half, saving brilliantly from Holifield and Horseman and it was Wycombe who were on the attack when the referee brought this-excellent game of football to a close. The Italians had few excuses in defeat and seemed to accept they lost to the superior side on the night — beaten, in fact, by sheer effort and teamwork. Winning skipper John Delaney received the trophy from the president of the Anglo Italian Competition Mr. Ugo Cessani, which the club will keep for one year. A smaller replica of the trophy was also awarded for the club to keep. 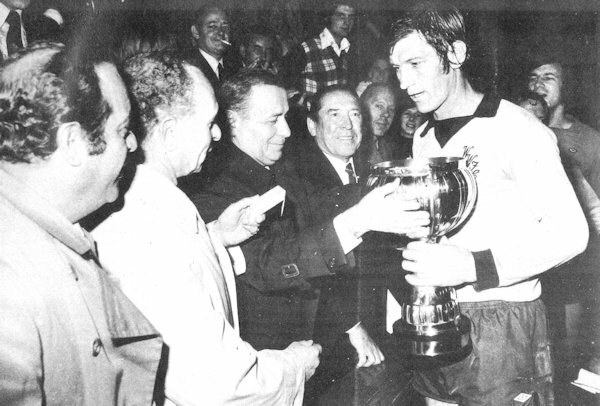 The Wanderers team also received gold medals as winners while the Italians received silver medals. Delaney is seen receving the Trophy from Ugo Cessani, president of the competition. To the right of Cessani is Wanderers Club President Monty Seymour.